The new internet dental marketing keyword glossary from Internet Dental Alliance explains terms doctors need to know for successful search marketing campaigns. At IDA, we're experts in the field of online new patient lead generation. Our new LeadFire technology creates turnkey dental practice websites -- that are fully customized and personalized -- within minutes. The new internet dental marketing keyword glossary from Internet Dental Alliance, Inc. (IDA) makes it easy for doctors to understand technical online marketing terms for their organic search campaigns. Just as patients don't need to attend dental school in order to receive successful treatment, doctors shouldn't have to become internet marketing professionals in order to successfully market their practices. But in both cases, it helps to know the basic relevant language in order to achieve the best results. 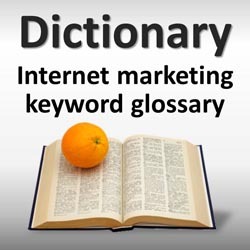 IDA's online glossary for dental marketing keywords is easy to access and serves as a handy reference doctors can use to understand the basic mechanics of their online marketing plans. By providing clear definitions of need-to-know terms, IDA's glossary flattens the internet marketing learning curve – an important feature for busy doctors. Internet marketing for dentist offices is no longer a luxury – it's a necessity. A 2011 survey conducted by LocalSearchInsider.com reported more than 40% decrease in the use of print directories (both yellow and white pages combined) by people searching for a local business. It's no secret that they're using online search engines instead. As a result, having a dental website that appears on the first page of the search engine results is one of the best internet marketing strategies a dental practice can implement. "At IDA, we're experts in the field of online new patient lead generation. Our new LeadFire technology creates turnkey dental practice websites -- that are fully customized and personalized -- within minutes," says dental marketing guru and Internet Dental Alliance, Inc. founder Jim Du Molin. "Each dentist website is strategically search engine optimized for the desired dental market keywords – including geotargeting for organic local search." IDA's online glossary for dentists explains important internet marketing concepts -- such as Search Engine Optimization (SEO), Organic Search Results, Local Search and Mobile Marketing – to make it easy for dentists to evaluate their need for online marketing campaigns, make good decisions and receive a return on their investment. IDA provides dental management advice and customized resources to dental practices, including online dental marketing services such as website design, find-a-dentist websites and dentist web sites which are search engine optimized based on dental market (dental SEO). Internet Dental Alliance is North America's largest provider of websites for dentists, email patient newsletters and dental directories. In 2012, it completed its advanced Lead Fire lead generation system, which automates content marketing, can be set up within minutes, is based on organic geo-targeted local search, and is customized for each dental office.